Bye-Bye Bin Laden gets a rave review on KGO radio! Click here to listen to an excerpt from the show. 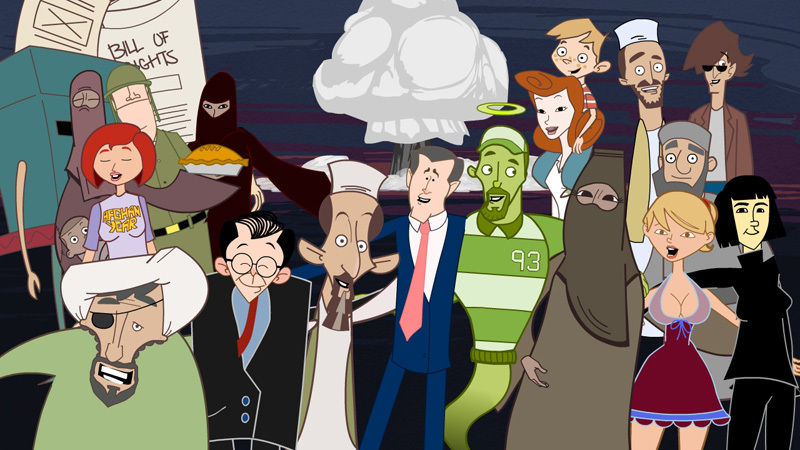 The feature-length animated musical Bye-Bye Bin Laden — a satire about war, TV, and religious excess, at home and abroad — was named Best Feature at the 2009 South Beach International Animation Film Festival. Based on the hit San Francisco stage musical that the Bay Guardian called, "smartly written, consistently funny, and well-acted," and that the San Jose Metro called "Irreverent? Yeah. Sick? Yeah. Funny? Hell, yeah!" Bye-Bye Bin Laden, with something to offend everyone, is this year's most outrageous animated feature. Bye-Bye Bin Laden is now available for purchase, distributed by Cinequest. Watch the first five minutes online for free!